Performance 2.0 Blue Garage Cabinet Set (14-Piece) Get your power tools, seasonal decorations, gardening supplies and more organized with the Performance 2.0 Series cabinet system. With durable 24-gauge steel frames and strong double-walled doors, these cabinets are built to last, and they're fully-lockable, so you can rest easy knowing your valuables are safe.Easy-to-grab stainless steel handles give quick access to your items, and a frameless door design provides a clean, contemporary look to your space, with height-adjustable legs to accommodate for uneven garage floors.Flip-up style doors on the Wall Cabinets allow for a wider opening for retrieving paint supplies, and cleaning items, while adjustable steel shelves in the Locker and Base cabinets give you a customizable storage solution, with plenty of room for all your belongings.Durable steel cabinets, great for any space. With the Performance 2.0 Series Garage Cabinets, your home just got a lot more functional. 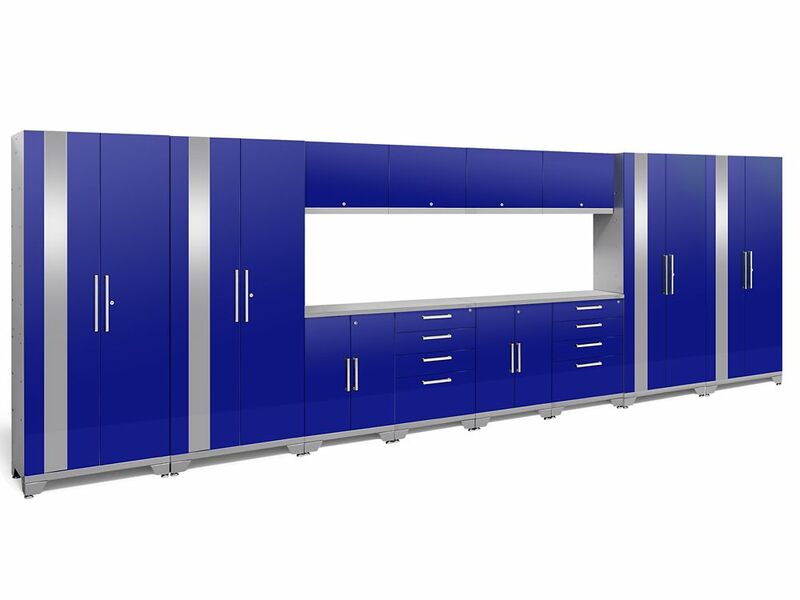 Performance 2.0 Blue Garage Cabinet Set (14-Piece) is rated 4.3 out of 5 by 4. Rated 5 out of 5 by wdlexan from Great product! Did some research and found this product to be an excellent product for this price point. They look great, are sturdy, well built and will last a lifetime. I previous had particle board cabinets from a big box chain store which were falling apart where the screws held the cabinet door hinges. These 'New Age' cabinets come pre-assembled and you just have to put the feet and handles on. The shelves are adjustable and held up in place by cuts and bends in the steel walls which is better than using pegs The instructions to assemble the cabinets are straightforward. The most difficult part was installing the overhead cabinets on the wall (you need another set of hands) and the was no included instructions for this. I would recommend securing the overhead cabinets into the studs in the wall and unfortunately the cabinets do not always align with the studs. To accommodate for this I screwed in a 1x 4 piece of wood perpendicular with the studs using the supplied lag bolts and then I screwed in the cabinets securely into the 1 x 4. The 1x4 also keeps the overhead cabinets away from the wall the same distance as the rest of the standing cabinets since I have baseboards. Rated 5 out of 5 by Pip80 from Very impressed Awesome product!! Very well manufactured everything went together and lined up and looks awesome very slick in the garage. Would definitely buy again if I needed more storage.